Early start so that we make the Turkish border before the queues are too long. 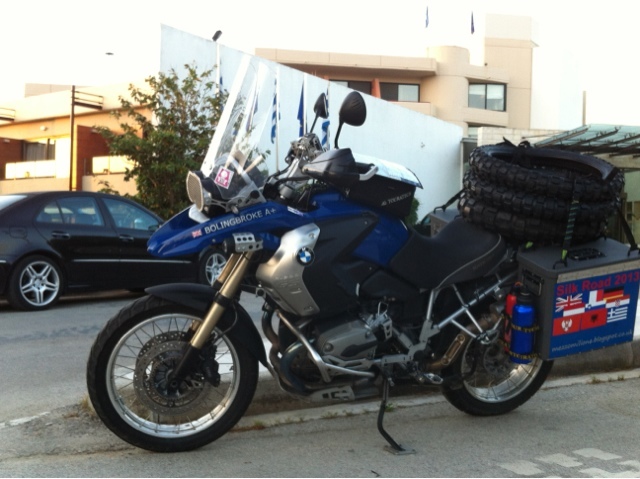 First we have to take the spare tyres out of the van and strap them to the bikes. Apparently the Turkish customs don't believe 40 new tyres in a van are for personal use. So we each import our own. Then a dull motorway to Istanbul. Though Chris and Susie witnessed a lorry crash, a tyre blowout and got pulled over by the police. Not so dull then. Istanbul is 13 million people driving 3 million cars through a city designed in 300AD. Surprisingly it works quite well. Turkish drivers have good manners and while you need to keep your wits about you and stay calm in the jams you will get there in one piece. We have a fabulous hotel right in the heart of the old city. Deefor is writing this sitting in the roof bar looking out at the bridge that connects Europe to Asia. When we cross it we start the Silk Road proper. We have a day off tomorrow to see Istanbul/Constantinople so a full report on the sights will follow later.